The Maine Black Bears Baseball team was rained out in Connecticut today and will make up 2 against Hartford. The Women's Softball team continue their winning ways by taking a double header from Binghamton in New York. The Portland Sea Dogs dropped a 2nd game to the Defenders on Saturday, 10 - 4. 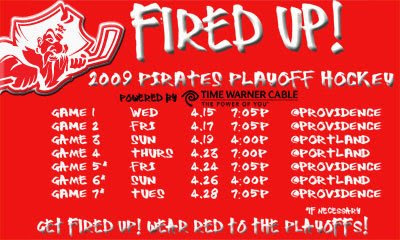 The AHL announced playoff pairings and schedules today, and the Portland Pirates draw the Providence Bruins in the 1st Round. The Pirates clinched a playoff birth by beating the Baby B's Friday night at the CX4. The Boston Red Sox got back on the winning side of things, beating the California Angels 5-4 on the back of 2 Jason Bay HR's...Manny who?!? The Boston Bruins got blasted by the Pirates parent club, the Buffalo Sabres. Manny Fernandez show once again he isn't the answer as Buffalo beats the Bruins 6 - 1. Jack Parker and Boston University won their 6 NCAA Hockey title in a 4 - 3 stunner in Washington DC. Down 3 - 1 with less than 1 minute to play, BU scored 2 times on Miami (OH) to tie the game. Then at 11:47 of OT, BU's Colby Cohen set up for a blue line blast when the Miami(OH) defenseman fell to the ice for the block in front of and delflected the puck into their own goal to give BU the title.